Consistently creating great content with a small team is a common challenge for many marketers today. As a three-person inbound marketing agency, we’re in the same boat. In this quick case study you will learn how we took the principle of content repurposing to the next level, the specific results it delivered, and how you can make it happen for your organization. A few months ago, a friend offered to introduce me to the editor of a large industry publication. He offered to broker the intro and open the opportunity to submit an article for an upcoming industry piece. He told me to have an idea ready to share that would be valuable to the reading audience before we set up a meeting. The audience for the publication is business owners in the industrial manufacturing space. I wanted to take the opportunity to share how they could use inbound marketing to grow their industrial business. With a clear understanding of the buyer persona, I knew that they would want a detailed picture of the ROI they could expect from the investment and they would need a checklist of action steps. With this in mind, I began outlining an article about the value of inbound marketing in industrial industries. Four hours later I had a 1,200 word article that was ready to send over to the publisher. It took a lot of time and energy to get that article up and ready to go. I wasn’t about to just let it go at that. After reviewing the article again, I realized that the content would make a great eBook. Since it was a print piece, the original article couldn’t dive into great depth, but an eBook that would be published on our blog could be as big as I wanted. I took each of the main points expressed in the article and broke them down into chapters of an eBook. It was really easy to fill out the content of each chapter, because the article had already established the outline of the story and the target persona. I pulled the copy into PowerPoint and started writing. The result was a 45-page resource called The B2B Marketing Checklist. It simply took the action steps I originally shared in the article and broke them down into more detailed descriptions. All of this content repurposing was happening while the article was still under review at the publisher. After the eBook was designed, the landing page created, and follow up-emails written, I had a resource that I could link to from the article. The context of the article made the value offered by the checklist stand out. Creating amazing content is only the first step toward success in marketing. Promoting the content is just as important, if not more important. While the audience and exposure that we would get from the publication would be great, we wanted to find a way to capture more value from the resources invested in creating the article and eBook. We decided to use blogging as a tool for promoting the checklist. I took the PowerPoint file and printed out the 45 slides in handout format. This made it really easy to go through the content in the checklist and identify points that we could break down in even further depth in a blog post. After reviewing the checklist, we had outlined 55 blog post titles! The crazy thing was, it wasn’t that hard. It was the context that was key. As you’re creating epic content, there’s always the underlying goal of providing the reader with a clear next step. While you’re creating blog posts, it can be a stretch at times to provide a related, next-step resource to the reader. By starting with the content offer and working backwards, you’re able to produce blog posts that are extremely relevant to your downloadable resource which you leverage to convert visitors to leads. This simple shift can help you greatly improve your conversion rate, but more on that in a little bit. This process has allowed us to created a large volume of quality content in a short period of time, while still expanding our reach to new audiences. Not only have we shared these posts on our blog, but we have reached out and shared several of these posts on other blogs, like HubSpot. Think of your central piece of content like the trunk of a tree. In our case it was an article for a trade publication, but it could be any number of things: a presentation from a conference, an in-depth industry report, or a course taught through your local chamber of commerce. Anything that is original and delivers deep value to the audience. Branches then shoot off from the trunk in multiple directions. The branches are the original piece of content, but repurposed as content offers and placed behind a lead-capturing form. These can be eBooks, webinars, checklists, buyer guides, and so on. From the branches of your tree, shoots emerge and climb heavenward. These shoots are blog posts. These are the leaves that attract the sunshine and nourish the entire tree. Each blog post is an opportunity to rank for new keyword phrases and answer questions from members of social communities. If the shoots are strong enough, they flower, and their sweet fragrance attracts new visitors back to the website. 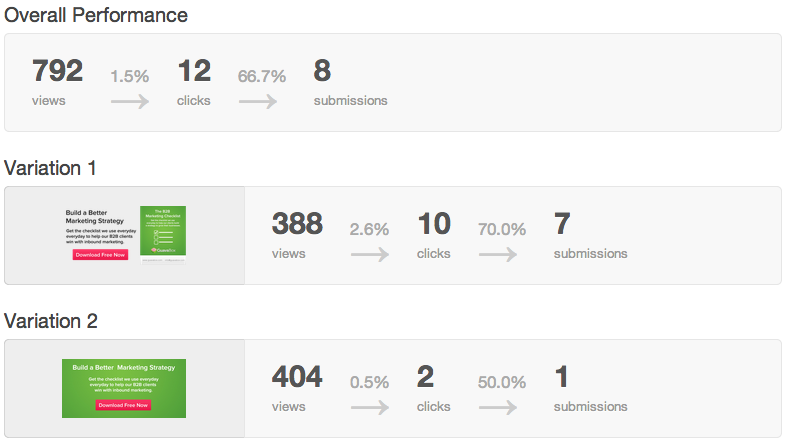 This takes shape via social shares, comments, +1’s, and inbound links. The tree metaphor is cute, but it isn’t worth much if it isn’t backed up with statistics. Here are some take-away points from our campaign. Keep in mind that as I’m writing this post the original article hasn’t even been published in the industry publication yet! In terms of traffic to our website, we saw almost a 30% increase in visitors. Our lead quantity also increased almost 40%. The more we blogged and shared the resource, the more leads began converting on The B2B Marketing Checklist. Not only did the number of leads converting on the offer continue to rise, but the conversion rate on the landing page also continued to rise. Managing content and your inbound marketing system is a challenge for marketers everywhere. There are a lot of moving parts that need to be working in unison. The Content Branching System can help you quickly outline and plan content for months in advance. With this plan in place, you’re still free to supplement your editorial calendar with curated posts or the latest industry news. It will bring you peace of mind to know that your team isn’t pressured to come up with unrelated creative ideas every few days. By beginning with your persona in mind and focusing on creating one solid piece of outrageously helpful content, you can supercharge your content creation. Make it rain, old sport!